Channeling – What is it? Channeling also known as ‘Mediumship’ is the phenomenon of a non-physical entity communicating psychically through a medium; the medium being a living human being. Conscious– Conscious channelling also known as ‘Trance mediumship’ is communication through a conscious individual. The person doing the channelling is fully aware and conscious of his/her surroundings and has complete conscious control over all mental faculties. The individual acting as the medium usually receives messages through thoughts from a non-physical entity. The individual then usually relays those messages by either writing them down or speaking and having the talk recorded by a voice recorder. Conscious channelling is known to be the least accurate of the two types of channelling as it is very open to subjective manipulation. The medium’s thoughts may convolute and jumble up the message the non-physical entity is trying to communicate, thereby creating a lot of error. Unconscious – Unconscious channelling also known as ‘Physical Mediumship’ is when the individual who is the medium goes into an altered state of consciousness such that they are not aware of their physical surroundings and lose control over their physical body and mental faculties. The individual’s consciousness takes a “back seat” so to speak as another entity takes temporary control over their physical body. The individual’s consciousness goes into a state similar to that of dreaming. The non-physical entity then utilizing the mediums body relays messages and can talk, hear and move around. In some cases the entity will operate the mediums eyes. While the person is channeling often their voice will change, they may speak with a slight accent and usually their demeanour changes completely. Channeling as a practice has been around for millennia. Attempts to communicate with the dead stretch back as far as humanity has had spirituality. Necromancers, Witches, Prophets, Sages, Druids, Oracles, and Shamans have often laid claim to being able to communicate with spirits in other dimensions. Possibly one of the first written attempts of channeling comes from the book of Samuel in the Bible. In chapter 28: 3-25 the Witch of Endor communicates with the recently deceased Samuel so that Saul may question him. Many tribes across the world have had rituals that people underwent so they could communicate with their ancestors in dream like trances. Often such individuals were under the affect of mind-altering drugs assisting them in bringing about an altered state of consciousness so communication with entities in other dimensions was possible. The Egyptians also employed certain rite of passage where communication with the dead was possible. The Greeks had their oracles, and is well known the Alexander the Great consulted them for guidance. In the medieval era many mystics and saints also sought communion with spirits and relayed messages most often in secret though fearing the wrath of the church. Historically channeling seems to have been primarily used in order to communicate with the recently deceased. Modern day Channeling circa 1800’s+ is more focused on messages about spiritual evolution and teachings from entities who claim to have achieved a high level of spiritual knowledge and thus their primary purpose being to educate. While not exactly channeling in conventional terms Edgar Cayce (1877-1945) had the ability to alter his state of consciousness where he was able to access what is known as the Akashic records and thus relay information from a non-physical data archive. The information Cayce relayed involved a lot of helpful information for the sick. He also relayed volumes of information on ancient Egypt as well as delving into many other spiritual things such as reincarnation, origin, destiny, karma and Universal Law. Seth as channelled by Jane Roberts (1929-1984) is probably one of the most well known entities channeled in modern times. Seth dictated what has come to be known as ‘The Seth Material’ a large collection of metaphysical texts. Seth himself dictated 8 books, in addition to much other material. Yale University Library maintains a comprehensive archive documenting most of the work by Jane Roberts as well as published and unpublished documents. The Seth material basically explores metaphysics from a philosophical perspective. The material can be quite difficult to read and understand and having a grasp of the basics in philosophy and metaphysics can be a great asset. The material covers many things such as Aspect Psychology, the Ego, the origins of the universe, the nature of physical reality, the purpose of life and the theory of evolution. Around 1977 Judy Zebra Knight (J.Z.Knight) began channeling the entity known as Ramtha a supposed Lemurian warrior who lived over 35,000 years ago. Ramtha’s teachings focus on the concept that consciousness and energy create the nature of reality and that the challenge of life on earth is to conquer one’s self. J.Z.Knight now runs a school of enlightenment which is attended by thousands of people annually through seminars. She and her organization have roughly released 120 books and 40 DVD’s. J.Z.Knight was most recently featured in the film ’What the Bleep Do we Know!?’. In 1989 Lee Carroll began channeling the entity known as Kryon. Kryon has also dictated numerous books providing spiritual guidance and education. In 1995 Lee was asked to present Kryon at the United Nations where he was well received and subsequently invited back five more times. What is of interesting note is that Kryon relays a lot of information on Sacred Names, Numerology and the function of DNA in both biological terms and metaphysical terms. Lee Carroll has a large team assembled that help him in understanding and explaining the material channeled. Included on the team are a few scientists. Esther Hicks is probably one of the most recent well known individuals to channel and she channels the entities known as Abraham. The material channeled from Abraham is collectively known as the Abraham-Hicks’ teachings. Esther Hicks is most known as being a narrator and a star in the film ‘The Secret’. It is also supposed that a lot of the material for the film was based on her work. 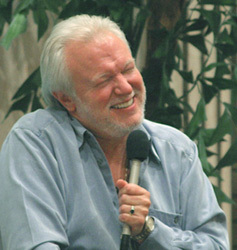 Hicks has published 9 books to date many of them becoming New York Times Best-sellers. The books deal mostly with what is known as the Law of Attraction and the ability to attract circumstances of your choosing through positive style thinking and affirmation. Channeling presupposes the existence of souls and or spirits. Therefore it is difficult to scientifically test whether channeling is valid or not unless we have some empirical means of determining if souls/spirits exist. Although channeling cannot be scientifically proven as of yet, it does remain theoretically possible. The channeled entities provide much information on the fundamental nature of the universe that one day may give credence to the phenomena. It is known from quantum physics that our universe exists in up to as many as 13 dimensions. Repeatable scientific peer reviewed evidence also shows that consciousness affects things by non-physical means, scientifically this is known as the observer effect. Now Consciousness because it can operate by non-physical means may partly or wholly exist non-physically in these other quantum dimensions. The theory being that the biological brain is merely an interface mechanism between higher dimensions and this physical dimension. Therefore it stands to reason that consciousness may exist independent of physical reality all together. And thus the “soul” could pre-exist life on earth, and potentially thereafter as well as any number of non-physical entities. Many ‘paranormal’ and seemingly ‘supernatural’ events and occurrences under the above framework could be explained scientifically utilizing the latest research in extra-dimensional quantum physics and consciousness. In order to empirically validate non-physical consciousness and entities in other dimensions a device would have to be constructed that could measure such energies. As of the current time, we don’t have the adequate advancement in technology to explore other dimensions empirically using our instruments. Until such a time channelling as a science will continue to be regarded as a pseudoscience. It is possible to validate the information provided by channeled entities and this currently would probably be the best way to test to see if such an entity were actually communicating through said individual. Modern day channeled entities rarely offer predictions of the future and when they do it is only in terms of probabilities. Therefore one could not test a channeled entity by those means. Because channeled entities exist in another dimension they may have the ability to see things in our dimension. A test could conceivably be devised where a channeled entity could be quizzed on randomly arranged objects in another room in a controlled setting. But even this wouldn’t provide conclusive proof in that the medium may have the ability of remote viewing or something of that nature. Generally most people who read channeled information and or adhere to its principles don’t really care what the source is. As long as the information is practical and makes philosophical rational sense there is no need to query further. Many of the channeled entities maintain that the information should speak for itself and if it does not, to freely disregard it. Because of this whether it is a channel, human being or a kuku bird relaying information, the source remains a moot point.